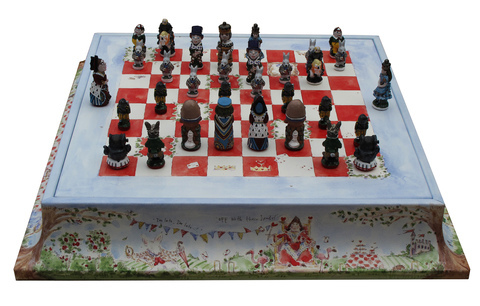 Parker captures the fantastical nature of Lewis Carroll's Alice in Wonderland with this printed-leather chess set that features stone-and-resin playing pieces based on the book's characters. A whimsical edition for the serious chess player, or a lovely decor piece for a child's room, you'll be so caught up with the beauty of this set, you'll surely be late to a very important date! This is all printed leather which is inlaid onto a wooden plinth. The playing pieces are stone and resin and then hand painted. Bases are covered with hand embossed leather pads.